Earlier this week, Sprint announced a very bold move, in which they would take any current contract agreement from Verizon or AT&T, and slash the price in half. For example, if you are currently on a 15GB Data Share plan from AT&T, totaling $160 a month, on Sprint, it would cost you just $80. 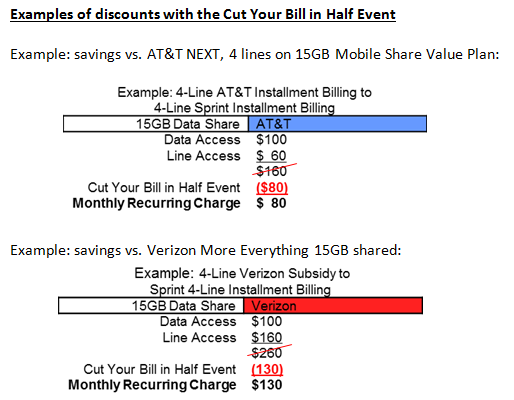 Theoretically, not only would your bill be 50% cheaper, but the Now Network states that they will waive activation fees ($36 per line), as well as buy out your current contract ($350 per line) from the competition. Sprint’s new CEO Marcelo Claure wrote an open letter as a press release to consumers, stating that he isn’t looking to just add to the “noise” in the industry. As the new CEO of Sprint, I’m committed to talking with our customers in a clear and straightforward way. Too often in our industry we have companies trying to shout over each other with claims that they are offering the best pricing EVER. We will not just add to this noise. “Best value in wireless” is not merely some slogan for those of us at Sprint. We stand behind it, and we want every American consumer to know it. Below are two examples of how this event works. If you were looking for more examples, you can check Sprint’s webpage dedicated to the promotion here. Personally, due to where I live, Sprint would not be on my list of contenders for my money, but I am hoping there are a few folks here that could greatly benefit from saving big money on their wireless bill every month. Are you making the switch? At least considering it?